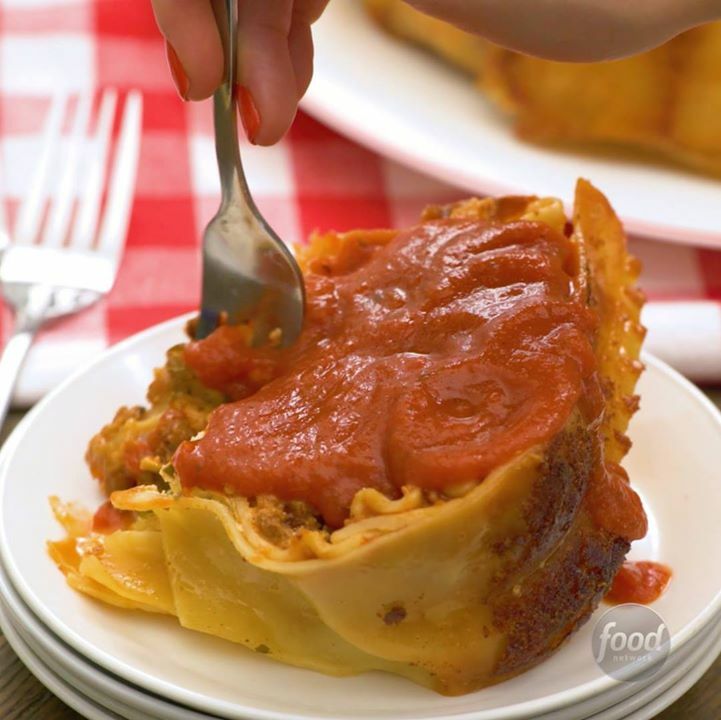 Here are traditional lasagna flavors in a party-stopping timpano presentation. 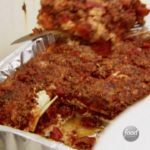 The lasagna noodles create a crisp shell for the traditional fillings within: meat sauce, cheese and sausage. Preheat the oven to 400 degrees F. Bring a large pot of salted water to a boil. Cook the noodles until pliable but still very al dente, about 3 minutes less than the package cooking time. Drain, but do not rinse. (The starch from the noodles will help them stick to the sides of the pan.) Spread on a baking sheet. Cut 4 of the noodles crosswise into thirds. Toss the breadcrumbs and 2 tablespoons Parmesan together in a small bowl. Spray a 10-inch tube pan with cooking spray. Coat with the Parmesan breadcrumbs, tapping out the excess. Combine the garlic, carrot, celery and onion in a food processor or mini food processor and process to a paste. Heat 1 tablespoon olive oil in a large skillet over medium heat. Prick each sausage with a fork and cook until browned, 5 to 6 minutes; remove and set aside. Add the remaining tablespoon olive oil to the skillet and crumble in the beef and pork. Cook, breaking up with a wooden spoon, until browned, about 4 minutes. Add the aromatic paste from the food processor. Cook, stirring occasionally, until it dries out, about 3 minutes. Make a space in the middle of the pan and add the tomato paste. Cook, stirring the tomato paste until it darkens a shade or two, about 2 minutes, then stir into the meat. Season with the oregano, red pepper flakes and ½ teaspoon salt. Add the white wine and cook until reduced by half, about 1 minute. Add 1 cup water and simmer rapidly until very thick, 4 to 5 minutes. Combine the ricotta, egg, basil, parsley and ½ cup Parmesan in a medium bowl. Line the prepared pan with the whole lasagna noodles, overlapping slightly. Spread about half of the meat sauce in the bottom of the pan on top of the noodles. Nestle the sausages into the meat sauce, pressing down to submerge them about halfway. Top with a third of the sliced mozzarella, breaking the slices to fit. Top with half of the cut noodle pieces and press down gently. Spread the ricotta mixture over the noodles and top with another third of the mozzarella. Top with the remaining cut noodles and press again. Spread over the remaining meat sauce and top with the remaining mozzarella. Fold over the noodles used to line the pan to encase the filling and brush with olive oil. Sprinkle with the remaining ¼ cup Parmesan. 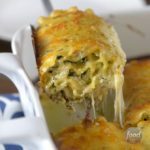 Cover the timpano with foil and bake until heated through, 30 to 35 minutes. Uncover and bake until the top is crisp and golden-brown, about 30 minutes more. Let rest 45 minutes to 1 hour before unmolding. Run an offset spatula or butter knife around the edges of the pan to ensure it can be removed with ease. 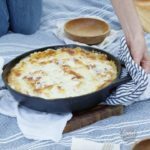 Unmold the lasagna by inverting it onto a serving platter. Arrange the basil sprigs in the middle. Slice with a serrated knife and serve with the marinara on the side. 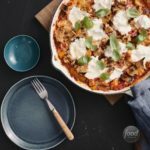 Recipe of the Day: Stuffed Lasagna Pie 😋😋Save this recipe: http://bit.ly/2BF2K0X.